Those of you familiar with Italian culture know that the superstitious are wary of Friday the 17th, because they believe it brings bad luck. Well, hate to break the news – but we at IFAD survived Friday 17th with flying marks. Here is a brief run-down of our Friday the 17th experience. 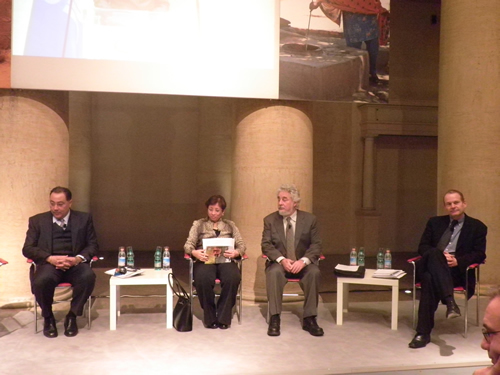 As part of the Rural Poverty Report 2011 roll out, on Friday 17 December, we organized a high-level panel discussion at Tempio di Adriano to discuss the report’s themes and findings. Our very own Mylene Kherallah, a graceful and eloquent mistress of ceremony, welcomed the over 150 participants to the event. Kherallah reminded the audience that the Rural Poverty Report 2011 provides a coherent and comprehensive look at rural poverty, its global consequences and the prospects for eradicating it. IFAD President, Dr Kanayo Nwanze, taking the floor presented an overview of the report’s themes, findings and recommendations. In his statement, the President highlighted the two significant threats facing the poor rural people: food price volatility and climate change. 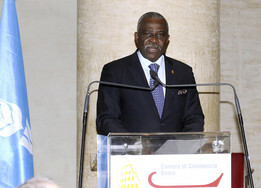 Nwanze also talked about the profound changes that are happening in rural areas – changes that are bringing new opportunities for progress in the effort to eradicate rural poverty and ensure global food security for decades to come. 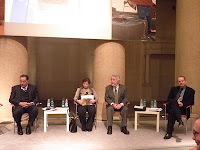 Following Dr Nwanze’s statement, a panel of eminent experts in rural poverty and food security moderated by Marta Dassu, Director-General for International Activities at the Aspen Institute Italia, featuring Hafez Ghanem, Assistant Director-General of the Food and Agriculture Organization of the United Nations; Uma Lele, an agricultural economist and former senior advisory to the World Bank; John Sender, Emeritus Professor of Economics, School of Oriental and African Studies at the University of London and Kevin Cleaver, Associate Vice-President for Programmes at IFAD, shared their views on the themes raised in the Rural Poverty Report and engaged in a compelling conversation with the audience. 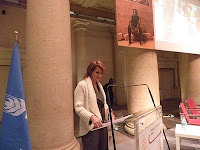 Mylene concluding the event highlighted that for IFAD, the high level of interest in the Rural Poverty Report 2011 is a validation of our work, and it inspires us to re-double our efforts to eradicate rural poverty. 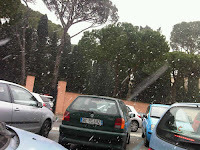 When we left Tempio di Adriano around 12:45, we were welcomed by an unusual phenomena for Rome. Talk about climate change – it was snowing. 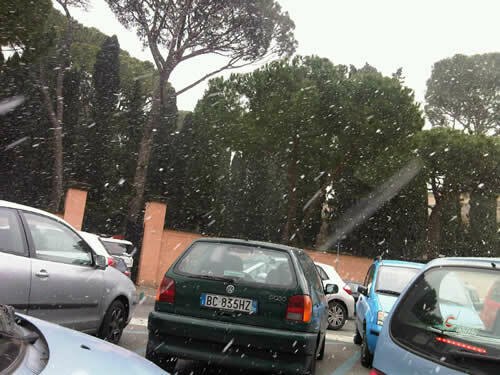 We get a lot of rain in Rome, but snow in Rome, is like having snow in the desert – a rare event and one that never fails to put a smile on everyone’s face. What is special and what makes this awards programme different from others is the fact that the nominations come from STAFF. Colleagues nominate colleagues and reward their actions and behaviours because they have done something special. 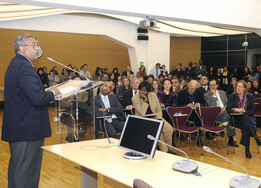 The IFAD awards programme was informed by Daniel Pink’s paradigm. Pink argues that “the secret to high performance and satisfaction is the deeply human need to direct our own lives, to learn and create new things, and to do better by ourselves and our world”. Inspired by Pink’s thinking, the IFAD award committee composed of Shyam Khadka, Mylene Kherallah, Marie-Paulette Duhart, Maria-Elena Mangiafico, Henock Kifle and Carla Ferreira, in reviewing the nominations, focused on rewarding motivation and more specifically the three elements of true motivation - autonomy, mastery, and purpose. purpose, the desire to do things in service of something larger than ourselves. 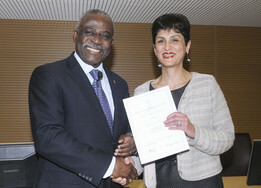 I believe that at IFAD we have space to be creative and inventive. It is up to us as individuals to take advantage of this opportunity and do something special. Yes - we have bureaucracy, yes - every once in a while we may experience a setback, but at the end of it all, if we want, we can bring about change; if we want, we can think out of the box; if we want, we can build something special; if we want, we can put our creativity to good use and if we want, we can continuously improve and do bigger and better things. It was heart-warming to hear Henock Kifle, Chief Development Strategist and the chairperson of the awards committee reporting that the committee had received 60 nominations. It was even more heart-warming to hear that 14 colleagues were nominated under leadership category, 20 for designing and implementing outstanding projects and 26 for agent and facilitators of change. And when Henock started reading the awardees under leadership category and read out the first name – Roberto Haudry – the entire plenary hall broke in a warm applause. 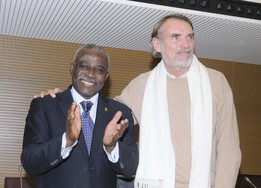 Roberto was recognized for pioneering and leading highly successful innovations during his long career at IFAD such as his trailblazing role as the first Country Programme Manager (CPM) to be outposted. Similarly, the “Learning Routes” initiative pioneered by Roberto have helped thousands of farmers, rural community leaders and government officials to exchange knowledge, information and experiences through visits to each other’s projects where they see first-hand what can be achieved. Roberto is a great innovator, a hard worker and someone who never gives up. Thanks to all these qualities, he has led the design and supervision of projects that have produced outstanding results ― achieving the highest average score in management's self evaluations. The second awardee in the leadership category was Henning Pederson. Henning stands out for his leadership capabilities in developing a country programmes and projects which are on the cutting edge of development practice, particularly in rural finance and value chain development. Henning was also singled out for his inspiring and empowering management style and as an outstanding mentor. And to prove this very point, it was not too much of a surprise, that one of his mentees – Omer Zafar and the Yemen country team –received an award outstanding project category. The Yemen country team led by Omer and composed of Dr. Fathia Bahran, Country Programme Officer, Nicole Hervieu and Jessica Lattughi were recognized for having completely transformed the Yemen portfolio from one that was based on a hand-out approach, to one based on creating sustainable economic opportunities that empower poor rural men and women. The new project designs for Yemen have been so highly regarded by other donors, including the Islamic Development Bank (IsDB) and the European Union, that they have together invested almost double the amount that IFAD has put it. The World Bank has also expressed interest in investing and the IsDB has recently announced that it stands ready to contribute over US$ 100 million to the forthcoming Yemen project, which focuses on rural employment generation. 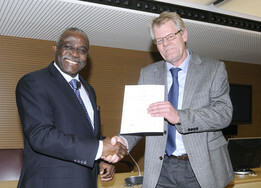 The next awardee in the outstanding project category was Edward Heinemann, the Rural Poverty Report 2011 team leader. 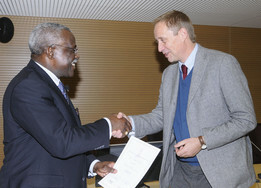 Ed was recognized for his outstanding efforts to finalize IFAD’s flagship publication. Work on the report started in late 2007 and, while much preparation was done, it became clear in 2009 that the project was losing momentum. In July 2009 senior management asked Ed to take over responsibility for the report. Ed, assisted by Bettina Prato rolled up his sleeves and started to draft and re-drafted the report several times with support and contributions from IFAD colleagues and external reviewers, producing the excellent report that we have today. Although only released ten days ago, those of you who follow this blog know that the Report has already received wide praise and is being recognized as one of the most comprehensive studies on the dynamics of rural poverty. A distinctive feature of the report is that it gives a human face to rural poverty through the personal narratives of ordinary poor rural people around the globe. It also advocates a number of important policy measures to tackle rural poverty. These will undoubtedly give impetus and drive the efforts of governments in developing countries and the international community to enhance national and global food security. 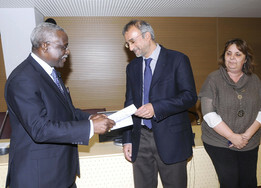 The team was recognized for its outstanding work in developing the Farmers’ Forum and creating a strong relationship between IFAD and farmers’ organizations across the developing world. Their efforts has led to the organizing the Farmers’ Forum every two years to coincide with the meetings of the Governing Council. In 2010 the Forum featured a special session to promote women’s leadership in farmers’ and rural producers’ organizations. Thanks to the work of the Farmers’ Forum team, IFAD has also continued to support global and regional farmers’ organizations in developing countries. 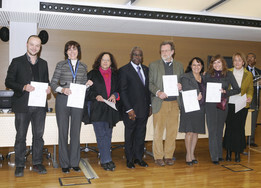 And through their work, IFAD has managed to amplify the voices of the rural poor in various global fora. The second awardee in the agent and facilitator of change was yours truly – Roxanna Samii. Those who follow this blog will remember that in February 2010 we used a number of social media and web2.0 tools to report live from the Farmers’ Forum. In a way I partially owe my award to the openness and willingness of the Farmers’ Forum team who embraced the idea of putting these tools into practice. I cannot but end this blogpost by referring back to Daniel Pink’s DRIVE paradigm. Pink’s paradigm is pushing us to embrace motivation 3.0 – where people are “motivated by the desire for autonomy over a task, for the mastery of a craft and for a sense of purpose”. The IFAD awards programme paid tribute to these people. For sure, the 2011 edition will pay tribute to many more motivated and inspiring colleagues. The six awardees will be receiving the official plaque at the forthcoming Governing Council. So please make sure you stay tuned, as we’ll be using social media and web2.0 tools to bring you live not only the award ceremony but the entire Governing Council event! 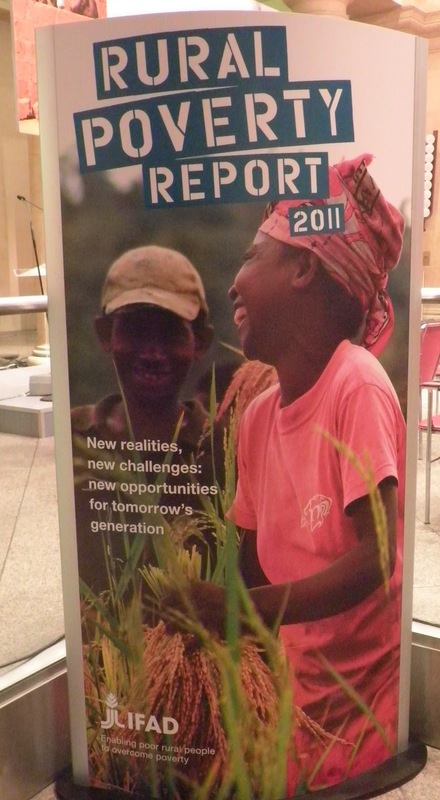 For now, Happy Holidays and on behalf of the IFAD social reporting team we wish you a prosperous 2011.